Mohammed Dahlan, PA chairman's exiled rival, takes part in public meeting with Hamas members of parliament. Mohammed Dahlan, Palestinian Authority (PA) chairman Mahmoud Abbas's exiled rival, on Thursday took part in a public meeting with Hamas members of parliament for the first time in a decade. 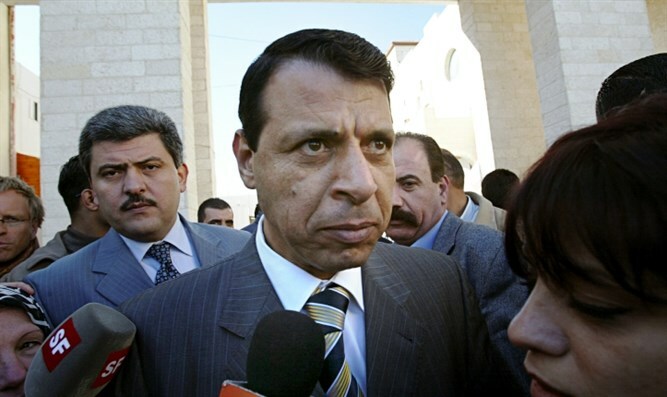 Dahlan, a former security chief in Gaza under Abbas's Fatah faction, was ousted from the party in 2011 and fled to Dubai. His home in Ramallah was later raided by PA security forces. Abbas has accused Dahlan of, among other things, collaborating with Israel to assassinate a senior Hamas terrorist in 2002. Dahlan was sentenced in absentia late last year to three years in prison for allegedly embezzling $16 million while serving as a Cabinet minister. Despite living in exile, he has been moving closer to Gaza's Hamas rulers in recent months, with rumors he could join a government in the Palestinian enclave. A portion of the Palestinian Legislative Council, which has not met in full since Hamas seized Gaza from Fatah in bloody coup in 2007, held an emergency session Thursday, reported AFP. Dahlan attended via video link, while seven of his allies in Gaza attended in person -- along with 22 Hamas members, according to Hamas's media office. The 132-member parliament is dominated by Hamas with 74 members, while Fatah has 45. Dahlan said he had been talking with Hamas to reach "understandings which are able to restore hope to the people of Gaza and alleviate their suffering." He added that talks with the groups were going well "but we are still at the beginning of the road." The meeting comes after a delegation headed by Hamas's Gaza leader Yihya Sinwar met with Dahlan in Cairo in June to discuss ways to resolve the crises in Gaza. Fatah recently finally acknowledged that it has no control over Gaza and is now trying to force it to return control of the enclave by creating economic pressure on the group. Reconciliation between Hamas and Dahlan would be seen as a blow for Abbas, noted AFP.